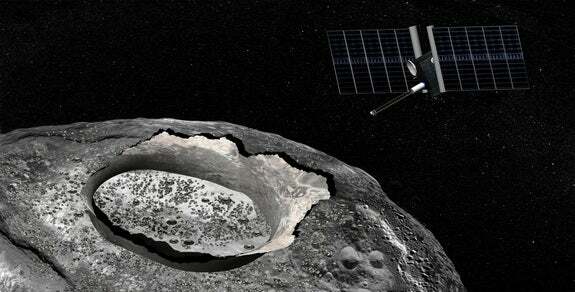 An ASU-led proposed mission to the asteroid Psyche was featured in Sunday’s London Times. Lindy Elkins-Tanton, School of Earth and Space Exploration director and principal investigator of the proposed mission, is leading a national and international team of scientists and engineers who propose to travel to the metal asteroid to map it and study its properties. As a metal asteroid, Psyche differs from the ice and/or rock worlds explored so far by humans. Deep within the terrestrial planets, including Earth, scientists infer the presence of metallic cores, but these lie unreachably far below the planets' rocky mantles and crusts. Psyche, located between Mars and Jupiter, is most likely the survivor of violent hit-and-run collisions, common when the solar system was forming. As such, it may be able to tell us how Earth’s core and the cores of the other terrestrial planets came to be.